Nobody plans to need an oxygen concentrator, it is just one of those things that suddenly can become a necessity to enable COPD sufferers to maintain an element of freedom in their lifestyle. Without planning or budgeting for such an eventuality, some of our customers find it difficult to be able to afford the outlay of purchasing a new portable oxygen concentrator. However there is no need to panic if the price of a new unit is prohibitive to your circumstances. At Pure O2 we have many years of experience and understanding of COPD conditions and the requirement for portable oxygen concentrators. Not only do we have the healthcare understanding, but also at Pure O2 we have qualified and experienced engineers who know all about the workings of all makes of oxygen concentrators. 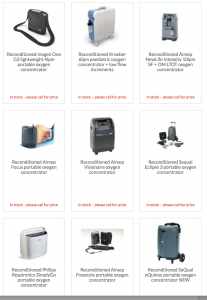 As a result we are able to offer our customers not only new units but also refurbished oxygen concentrators as well as ex-demonstration models and pre-owned units. Could a refurbished oxygen concentrator improve your quality of life? Ex-demonstration models – these are models which have had a very low usage and are just used by our company engineers as the name suggests to demonstrate how they work. Refurbished oxygen concentrators – these units may have had a key part replaced. Preowned units – often customers sell back their units to us when they are no longer required, so these are second hand but have been fully serviced and checked by our engineers. To see some of the makes and models available see the appropriate page on our website http://www.healthoxygen.com/portable-o2/exchange-centre.html. All models in these categories represent great value for money and come with a 7 day money back guarantee. For further information and to chat to one of our friendly and trusted advisors do give us a call on our 24 hour helpline on 0870 712 0202, or our UK freephone number (9am – 5pm) on 0800 145 5902 or alternatively if you are calling from overseas you can use our international number +44 (0)161 747 2617.